Banana bread is a breakfast staple for many and a welcome treat at tea time, as well. For vegans, banana bread is usually a no-go without the appropriate substitutions. While most banana bread recipes contain dairy and eggs, this vegan banana bread variation uses neither, yet it's still moist and delicious. Feel free to add walnuts, raisins or dark dairy-free chocolate chips to dress up your bread. If you skip nuts in the recipe, you can spread nut butter and honey on banana bread for a heartier taste. A trick to get the most banana flavor is to let your bananas get very, very ripe. Let them get almost completely brown. This develops the most complex and intense banana flavor. Preheat the oven to 350 F. Lightly oil a 9-by-5-inch loaf pan and set aside. In a medium-sized mixing bowl, sift together the flour, white sugar, dark brown sugar, baking soda, salt, and cinnamon. In a large mixing bowl, whisk together the soy milk and cider vinegar and let it stand for 2 minutes. Add the mashed banana, canola oil, maple syrup, and vanilla extract, whisking until well combined. Add the dry ingredients to the wet, mixing until just combined (do not over-mix). Fold in the chopped nuts (if using) and pour the batter into the prepared loaf pan. Bake for about 1 hour, or until a toothpick inserted into the center emerges clean. Allow the bread to cool on a wire cooling rack for 20 minutes before serving. If you are using a muffin tin as opposes to the loaf pan, cut down cooking time by one-third to one-fourth. If using a mini loaf pan, cooking time can be cut down by about half. Baking times will vary given the size of your muffin tin or mini loaf pan, but a regular-size muffin tin should take no more than 15 to 20 minutes, while mini loaves shouldn't take more than 40 to 45 minutes. Use the same oven temperature. Remember to test doneness by using the toothpick test. 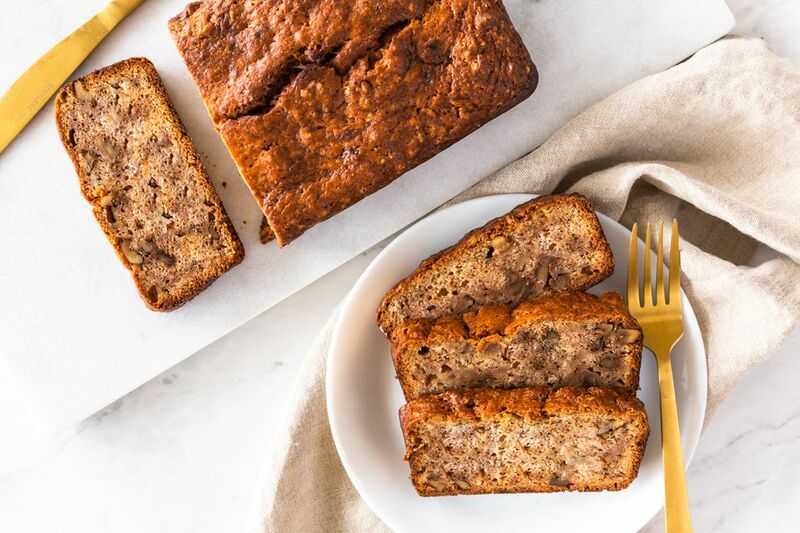 This banana bread recipe is super moist fresh out of the oven, but storing it properly is important to maintain the taste and texture of this vegan bread, given its lack of eggs and dairy. Bread may be kept at room temperature for up to two days in a breadbox. Cover it with foil or plastic wrap to keep it from drying out. If you cook a large batch and want to keep it more than four or five days, you can freeze banana bread in portions or whole loaves. To defrost, thaw the wrapped banana bread at room temperature for an hour or so. After it has thawed, re-wrap the bread in foil and bake in the oven at 300 F for 45 minutes. Check and bake up to 15 minutes longer for the perfect serving temperature and texture.